Since last summer, coffee shop talk has been centered on the low price of walnuts. We all hope to see improvement in pricing soon. Even if prices increase, there are cultural and pest management options to improving your profit margin. We will have one quarterly article in 2019 that will focus on labor and cost cutting considerations appropriate to the season, while discussing those operations you should not scrimp on. Typically bare rooted finished trees are about 5 to 6 feet tall at delivery and cut back to 3 to 6 buds after planting. Research and grower observation trials have shown trees left unheaded after planting grow as well or better than those headed back (photo 1). Initially unheaded trees may grow more slowly but fewer problems like bending in the wind have been observed. 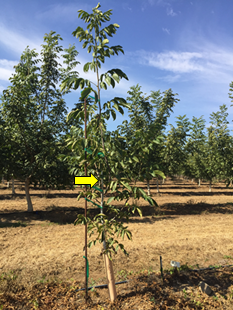 A 5-year study comparing different heading heights at planting using several varieties and rootstocks was conducted by UCCE Walnut Specialist Bruce Lampinen at UC Davis. He headed back trees to 3, 6, 9, or 12 buds at planting. After 1½ years and for the remaining 3 years, there were no significant differences in tree height between the treatments. On finished trees at planting, consider skipping the heading back step to save money, but not the painting step. Since 2004, there have been 14 statewide replicated trials either completed or ongoing comparing the no pruning/no heading training method to the minimum pruning training method. Varieties compared include Chandler, Howard, Forde, Solano, Tulare, and Livermore on seedling or clonal Paradox or own-rooted Chandler and Howard. There are no trials comparing trees on black rootstock. Additionally, there are many grower trials and those who have adopted the no pruning/no heading method. In two completed studies, yields were not significantly different for any pruning treatment after 7 years. 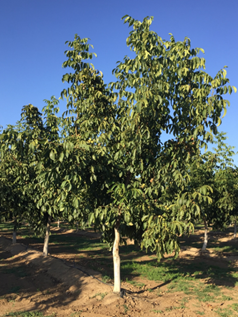 There were no benefits to pruning compared to the unpruned/unheaded treatment during the young development stage of walnut trees. The only additional cost to the no pruning/no heading method may be the need for stake extensions during the 2nd leaf growing season. If an insect growth regulator insecticide was used for scale within the last two years, monitoring may indicate that a spray is not needed this year.